Top, from left to right: Gubernatorial candidates Travis Allen, Gavin Newsom and Delaine Eastin. Bottom: Candidates Antonio Villaraigosa, John Chiang and John Cox. 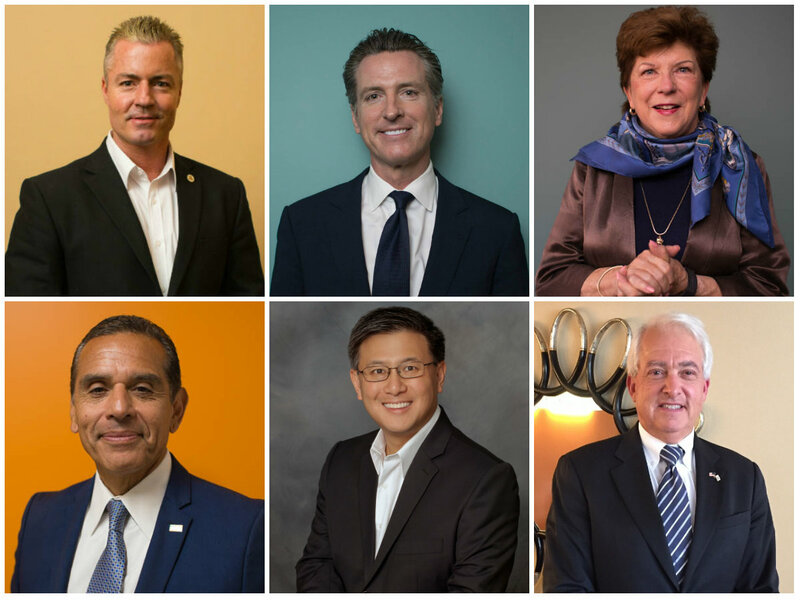 Listen to Capital Public Radio’s new podcast, “California’s Next Governor,” for interviews with all six candidates. When the six leading candidates for California governor debated Tuesday night in San Jose for what might be the only time in this final month before the June 5 primary election, their tactics illustrated each campaign’s strategy as the race enters a crucial stretch. The frontrunner always draws the most fire in political debates, and it was no surprise that Democratic Lt. Gov. Gavin Newsom spent much of the night fending off attacks. Chiang was referring to a policy of Newsom’s while mayor of San Francisco. Newsom ordered that minors facing felony charges and suspected of being in the country illegally be reported to U.S. Immigration and Customs Enforcement for deportation, regardless of whether they were eventually convicted of a crime. Newsom’s response, when prompted by moderator Chuck Todd of NBC, illustrated his own strategy aimed at cementing his status as frontrunner: He ignored the other Democrats while attacking the two Republicans: businessman John Cox and Assemblyman Travis Allen. His goal, presumably, was to raise their profiles with GOP voters — and boost their chances at finishing second in June and advancing to the November general election. When Todd asked Newsom whether he worked with the federal government on deporting minors while mayor, he described himself as a “poster child” for sanctuary policy. “Oh, I just did, Chuck, thank you,” Newsom answered. Polls suggest Chiang needs to overtake Cox and Democrat Antonio Villaraigosa, the former mayor of Los Angeles, to reach second place. But Chiang focused most of his fire on Newsom. And Villaraigosa, who many observers expected to go on the offensive, held his fire. “I’m not going to respond to fake news,” Villaraigosa quipped to an attack from Chiang. Villaraigosa may have floated above the fray. But on the other hand, he rarely stood out. Democrat Delaine Eastin, a former superintendent of schools, stood out repeatedly with fiery one-liners. “The president of the United States leaves me just jaw-dropping all the time. I have never seen a racist misogynist lead my nation as this man has,” she said at one point. Eastin trails in the polls, and it remains to be seen whether her performance will spark voters to shift their support to her — and away from the better-known and better-funded Democrats. And then there were the Republicans. Cox and Allen took shots at Newsom all night long, but they just as frequently squabbled with each other. One of their favorite arguments: which of them deserves the most credit for the likely November ballot measure to repeal the gas tax increase for road repairs signed last year by Gov. Jerry Brown. For either Republican to advance to November — and give their party a boost in turnout that GOP congressional candidates sorely need — one must emerge ahead of the other. It’s not clear that either one did so in the debate. That would seem to leave Cox, who’s better-funded, with the advantage. Newsom, too, departs the debate with the same advantage he entered it with: a lead in the polls and more than enough money to make his case — as election month gets under way with the arrival of vote-by-mail ballots this week. How did the six top candidates for California's next governor do in their first televised meetup? CapRadio's Ben Adler has analysis. Sacramento State's director of debate discusses how the six gubernatorial candidates performed in Tuesday night's debate. PolitiFact California reporter Chris Nichols shares his impressions from the governor's debate. Were the six participating candidates truthful? PolitiFact California's early impressions on statements made at Tuesday's gubernatorial candidates debate in San Jose. The six leading candidates for California governor debated on Tuesday evening in San Jose as vote-by-mail ballots arrive for the June 5 primary election.